We had some Day #4 excitement when our tack line suddenly blew – instantly turning our giant spinnaker into an immense flapping 1850 square foot flag! 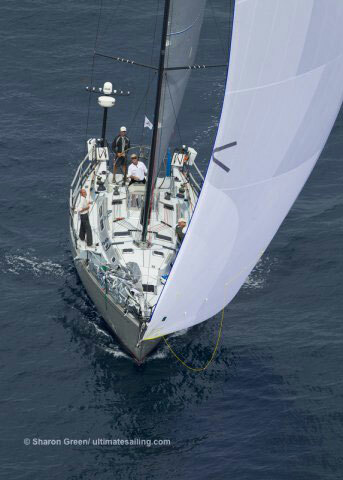 We all jumped into action … dropping our gourmet lunches and scrambling to pull the spinnaker, rig a temporary tack line – and hoist in its place the heavier, stronger spinnaker. It took only about 10 minutes I suppose, before we were back up to speed and racing again. Such fire drills are not unusual in long distance races, and checking gear frequently is the best way of minimizing the damage and delay. 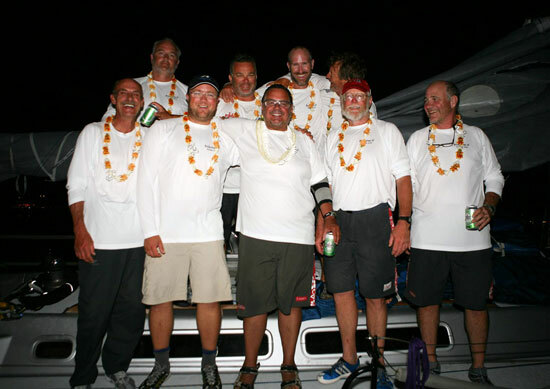 When last we spoke, Bodacious IV was 100 miles from the finish of the Tranpac, proceeding along the north coast of Maui and through the Hawaiian Islands towards Oahu. 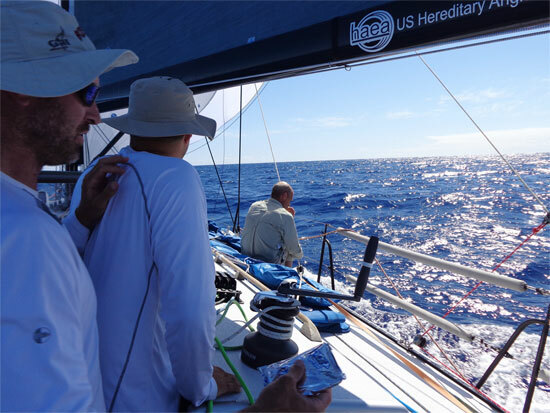 Sailing along at 10 to 12 knots, after so many days, turns things a little less exciting and more mundane as the miles pass and your senses become accustomed to the speed – that is, until nature decides to throw something unexpected in your path. So it was during our last 100 miles. 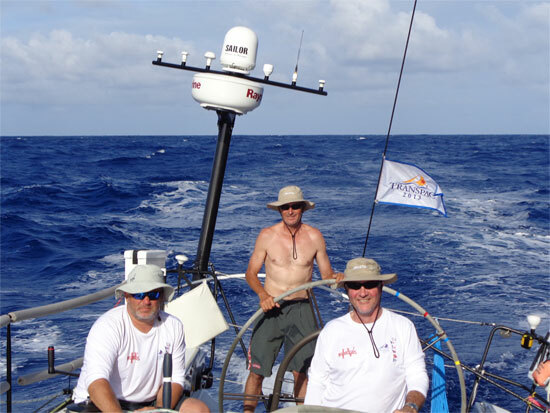 Just after Midnight (Hawaii Time) – we were caught by a stalking “squall” which zapped us with a 30 degree change in wind direction and kicked the wind speeds from 16 to 25 knots, while at the same time managing to spit a few buckets of rain on us – which threw our groggy crew into “sail or fail” mode! 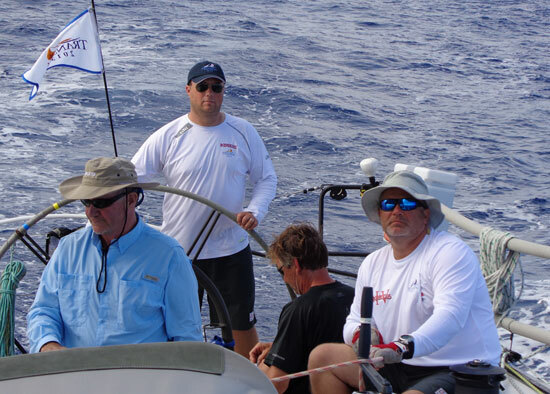 Fast action by Matt Scharl at the helm and by all hands, none of whom were able to sleep through the excitement, kept the boat on her feet and scooting on through the Molokai Channel on the course for Oahu, and Honolulu. 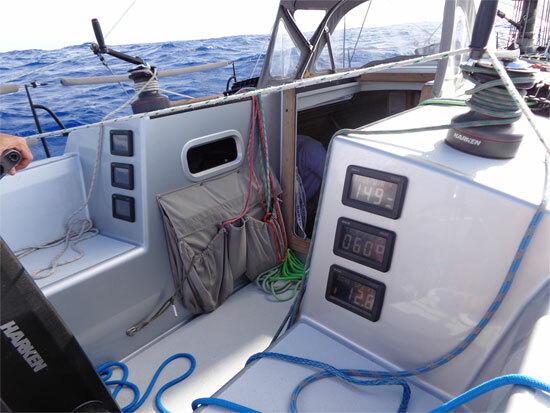 During those squally conditions, we sailed 17 miles in 80 minutes … and that was “as the crow flies.” So, actually it was probably more like 20 miles in 80 minutes if you figure in the gybes, which add in extra zig-zag miles. That’s some good fun sailing to say the least, but it also takes a pretty strong and alert crew to take full advantage of all that extra wind speed. As the squall moved on, once more indifferent to us, we settled into a more relaxed sail to the finish. The Molokai Channel, for us post-squall, didn’t quite live up to its reputation for accelerated winds and large surfing seas. Once across the 25-mile wide channel, we sailed down the coast of Oahu, much of it glittering with the lights of civilization. These shimmering strands provided an interesting perspective from the sea — the lights of the streets and buildings coursing along the veins of the ancient lava flows of the island’s origination, highlighting the major formations as if they were solidified lava flows. 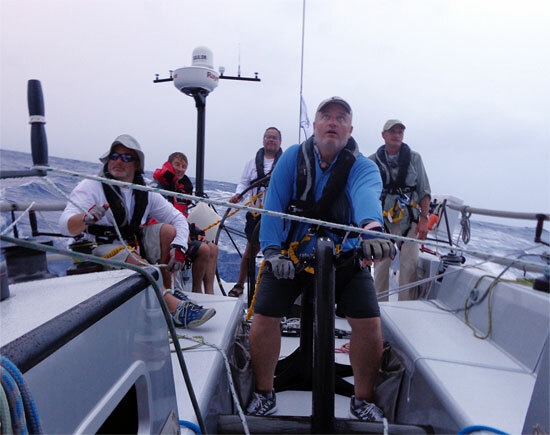 As we cleared Makapu’u Point still in the middle of the night, light from the bright full moon silhouetted majestic Diamond Head, causing us to focus our final moments of racing on the red flashing light that signaled the finish line of the 2250 mile long Transpac Race. Moments after crossing the indicated finish line, our finish was officially confirmed by the race committee – the first boat in our Division (#6) to the finish! 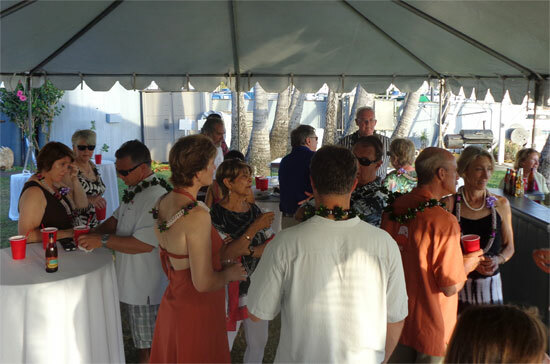 Even at the hour of 5AM, a rousing reception awaited us at the docks of the Hawaii Yacht Club, as we rolled into harbor and into the traditional and festive welcoming party for finishing boats. This made our arrival in the early, pre-dawn light such a delight for the brined and blurry gang of Bo IV. Leis were placed on all crewmembers and even one on the bow of our beloved Bodacious IV as well. Obviously, this tradition also serves as a ploy to displace the seasoned smell of 9 men after 11 days of sailing in the confines of small boat crossing the huge Pacific Ocean! 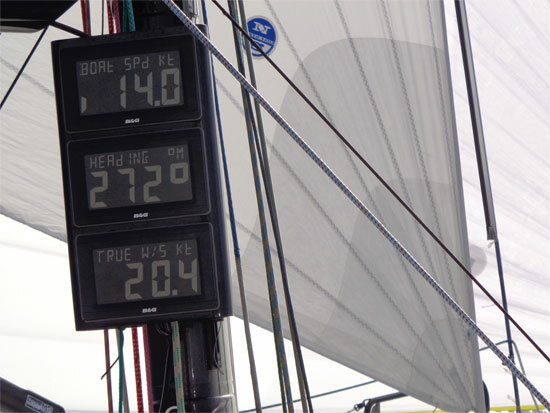 Now as far as the actual scoring for the race goes, the way the Transpac works (and other races too) is that boats – even boats of similar length and design, have certain distinctions between them in terms of mast height, keel configuration, etc. and so a handicapping method is used so that once the boats finish, times are corrected to account for those handicaps and from that, final positions are determined. So it is, that while we were the first through the “barn door,” our final placement in our division was third behind Horizon and Medusa. 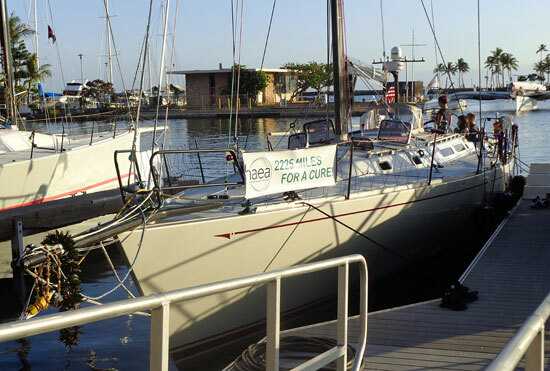 So, after some thick as concrete slumber, it’s time to clean up Bodacious IV; wash the salt from the equipment, dry out the sails, pack away the equipment and prepare her for a reception in honor our friends at HAEA (the US Hereditary Angioedema Association). 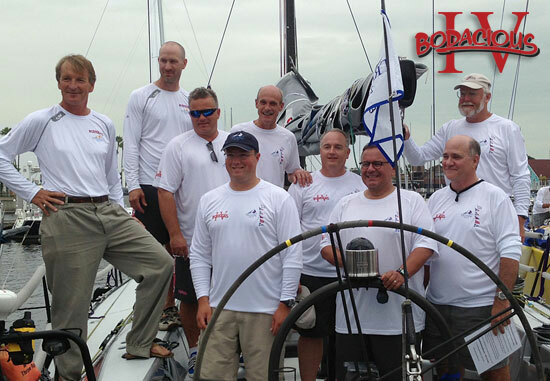 As I expect you all know by now, we’ve been sailing this race to bring awareness to this devastating disease. I’ve learned a lot about it in the process, and as I hear more about the effects that attend to someone missing vital blood protein and how quickly it can take away the very breath of life, I am honored to share a part of my lucky life to help bring some awareness to the goals of the HAEA. 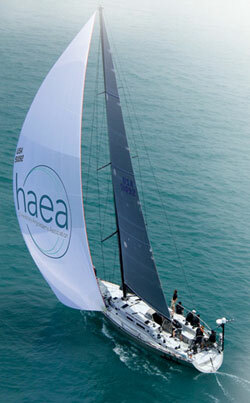 In fact, this afternoon, we will be sporting our HAEA insignias and hosting them all for a party at the Hawaii Yacht Club. Beyond that, VIDEOS and more PHOTOS of the sailing and the crew will be coming here and to our YouTube channel here very soon. I’ll also do my best to get you updates on the various celebrations going on here this week in Hawaii. 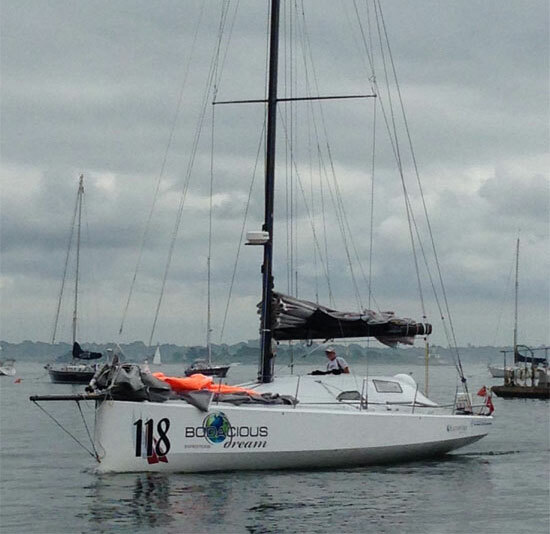 Least you think that it’s all party time now, Captain Tim Eades and I will be spending the next week or so disassembling Bodacious IV, and packing her up for ocean shipment back to the US mainland and then across land to Newport, RI where she will await her next races. Hawaii though … not a bad place to have to work on a boat! Until later … many thanks to all of you for your support! 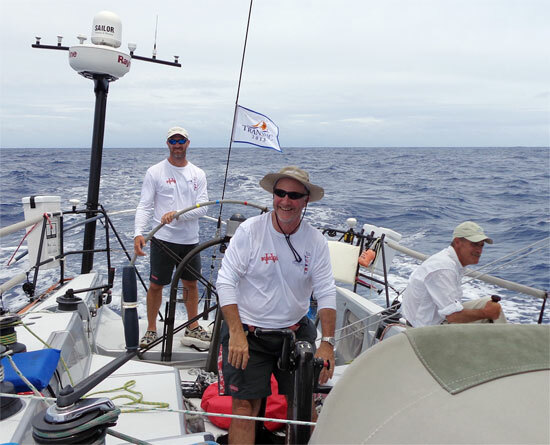 Transpac Update – Day #11 – 100 miles to go! Day #11 arrives and it finds us in the Islands! 100 miles to go … and we are now into the final hours of the race! We sighted Maui in a distant haze about 4:30 PM Sunday, and at this point, have passed along most of its length. We seem to be continuing to add miles to our lead, as our Division 6 cohorts all begin to converge on Oahu. 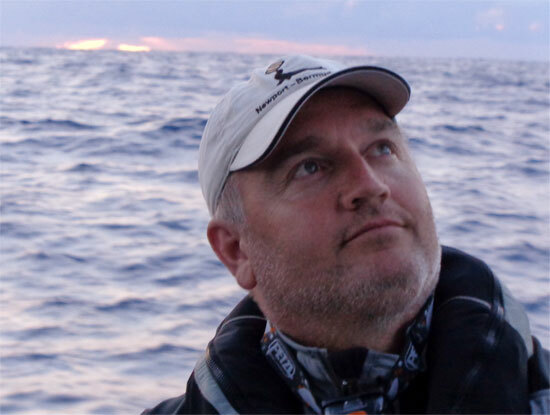 Naturally, we’re hoping the winds stay fair for us, and that our navigator extraordinaire John Hoskins and his grand strategy and navigation plan continue to pay dividends. Along the coast of Maui, we saw a pod of whales today. We’re pretty sure they were pilot whales; three of them surfaced and crossed our path; always a joy to see such amazing creatures. We continue to see flying fish, as well as more and more birds and occasionally some dolphins. Fatigue and endurance are constant factors that arise at this point in a long distance event such as this. 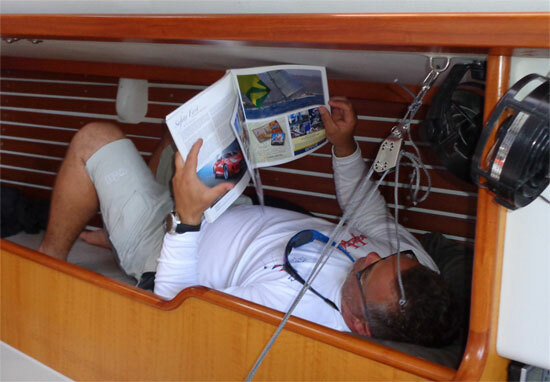 Each crewmember has a different level of endurance balanced by different sleep requirements. What makes a team like ours work so well is that some of us get by on less sleep, while others need more. At the same time, some sleep sporadically while others sleep at least a portion of every off-watch! When it happens, as it did Sunday, that we encounter unexpected problems, various crewmembers must spend extra time on these chores, while others step up and take on extra hours of duty to give those physically more tired, a chance to rest up. It would be a very interesting study for a sleep specialist to look at the nine of us in order to map and compare our various behaviors. What is most important to realize when considering the racing lifestyle is that though we have four hours on and four hours off, no one ever gets a full eight hours of sleep. So, unlike our lives on land, where most of us sleep seven or eight hours, and then are up for sixteen or seventeen, out here we are up for four hours and then down for four – assuming of course that you can actually sleep in the available window. 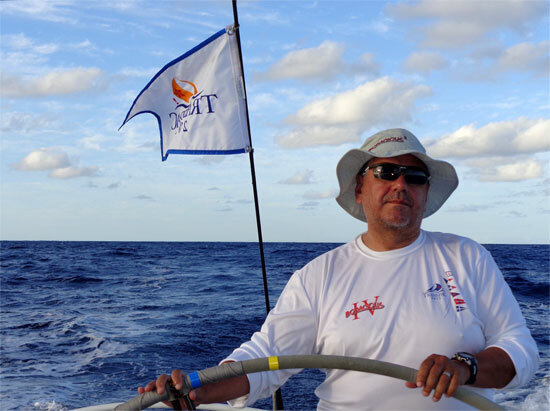 Long distance sailing like this … and even more extreme events like the extended singlehanded sailing events that some of us compete in individually, can be among the most physically demanding of sporting events. Here’s the latest race standings from late Sunday night! So, here we come HONOLULU! We’re hoping for an early morning arrival … so look for some kind of announcement on the Transpac website and on their Transpac Facebook page. 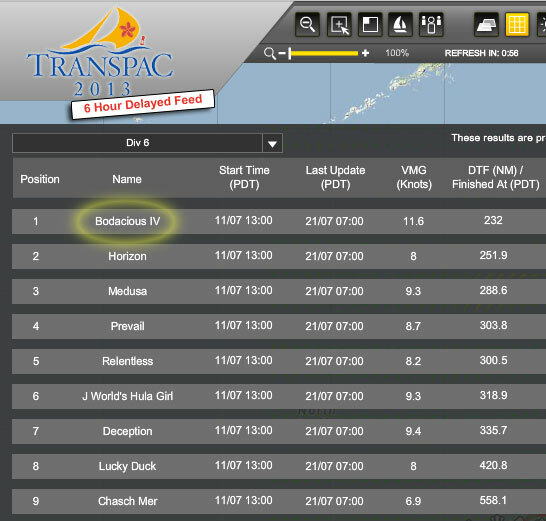 Big kudos to Dobbs Davis and Jeremy Leonard and the Transpac Media Crew for doing a great (and difficult) job! We’ll post something as soon as we can … so expect some news one way or another – either in your inbox, on our BD CAPTAIN’S BLOG or on our BD FACEBOOK PAGE very soon. Another big thank you to all who generously gave to our HAEA! It’s never too late to help. 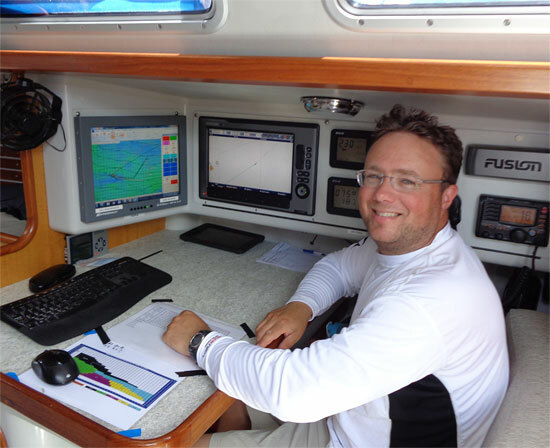 And lastly, a big shout out to Mark Petrakis of Firm Solutions … for his adept handling of the shore-side communications – and making sure that all of this groggy sailor’s missives got out to you as intended! Ok … more after we land, and after we pop a few cold somethings! Once more, all of our gratitude for keeping up with us the way you have, and for all your welcome notes and comments. So, it’s late night Wednesday, as we are still on California time, but we’ve obviously traversed far enough west now that we should be in another time zone … as it’s clear the ritual panoramas of sunrise and sunset have changed during our fixed four hour on and off watches. A few hours ago, we crossed the 1000 miles left to Hawaii threshold. 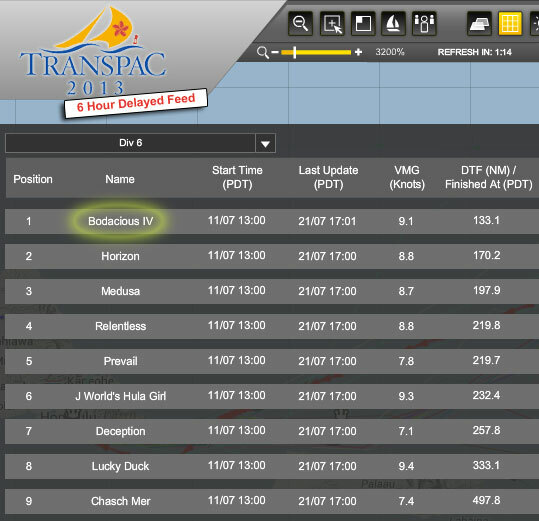 Now you might not have seen that on the Race Tracker at the same time as we did, because they installed a 6-hour delay on the tracker to keep competitors from knowing too much too soon about each other’s strategies. Of course, if any of them are near enough for you to see, who needs the tracker, right? This kind of delay is fairly typical of many longer racing events. Ah, what fun! Who knows if our strategy will work or not. After all … we ARE partnering here with the sea and the winds and the weather … so it’s still anybody’s game! I hesitate to use the word “routine” to describe today … because nothing about standing “out here”, sailing “on this” and sharing this experience with “who’s here” suits that word … but nevertheless, today was not all that different from yesterday. The big difference today involved changes in both mileage and the weather. The winds have steadied some and the skies have cleared, so we are at the moment sailing under perfectly clear skies with a beautiful moon and sparkling cover of stars overhead. 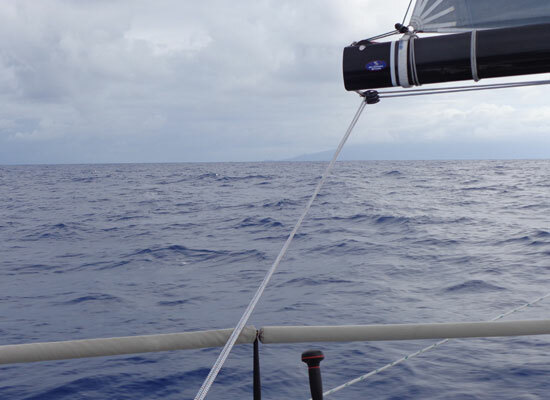 This is what we came for … amazing trade wind sailing … a most beautiful experience. And, along with this … is the glowing magic of phosphorescent plankton, which looks like streams of fireflies trailing out from alongside the boat in the wake of our path. I wish there was some way for me to show you this, to capture in a photo what I’m seeing right now … as I’m sure you’d fall under the spell of the magical sea much as all of us here have. As far as the trash report goes, while on the one hand, we’ve seen fewer logs and big debris floating by in the last few days, sadly on the other hand; we’ve seen more small plastic articles, styrofoam and floats. While we sail out here far from land in the middle of the vastness, there is still no escape from these reminders of man’s influence on even the world’s wildest environments. So, to sum ‘er up … today we had a special sail and enjoyed taking part in the interesting and exciting strategies playing out on the race course. We’re excited to be moving along quickly towards the amazing islands of Hawaii and though we’ll sail fast towards them, I am sure as we get closer, we’ll be wanting to drag our feet just a little to slow life down so that we can stay just a little bit longer in this magical bubble. 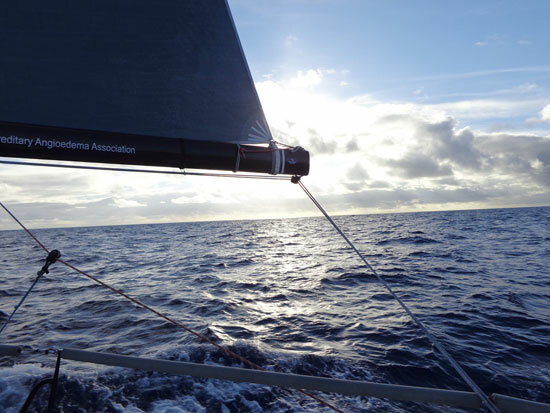 Tuesday, end of Day #5 (at least we’re kind of sure it’s #5) and we’re moving along pretty well … still sailing on the spinnaker and making about 9-10 knots, even in today’s lighter winds. We’re learning too about the “squalls” of the Pacific. Squalls are small, localized rain showers that pop up and create stronger wind in front of them and to their left side. But if you make the mistake of getting behind them or to their right, they shut the winds down. We put some good moves on the first of last night’s squalls, and so found ourselves topping out at 20 knots of speed in 25 knots of wind. And as arrogance will always beat you back, just when we thought we were self-proclaimed experts at squall riding, we found ourselves languishing in the next one. So it is, we keep on learning! 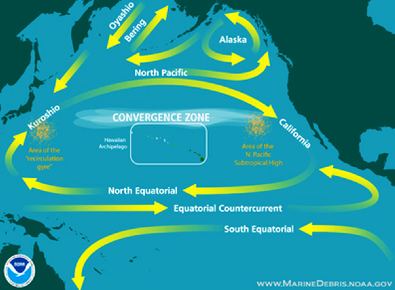 Every new part of the ocean you visit, it’s Sailing 101 all over again. 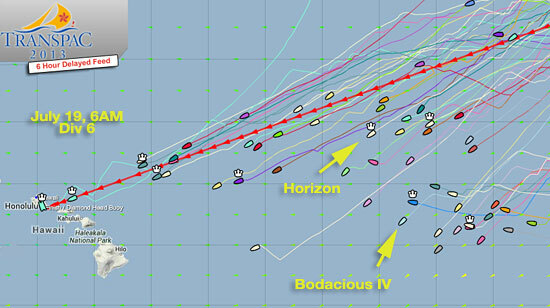 At present, we are less than 1100 miles away from Hawaii, and our hope is for a finish sometime on Sunday. Now that may be wishful thinking … but out here on Day #5 (You sure it’s not #6?) your mind can’t help play that game of time and distance and trying to predict when your first hot shower might be! We are lucky here though … make no mistake about that. 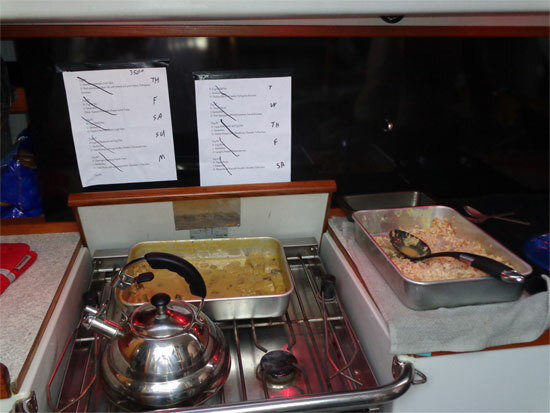 I am sure that many or our competitors are dreaming of good food before showers, whereas we’re worried that we won’t find food as good when we arrive as we have out here. On that score, we are very well fed and happy … probably one of the few crews that will land with the same waist size as when we left California! Otherwise, the days are fairly typical … though they never quite seem to begin or end, but for the slow revelation of a sunrise or a sunset. Today’s sunrise was followed in short order by Capt. Tim’s now-famous “BodEGGcious McMuffins” – Canadian bacon, French cheese and a Finish Egg on an English muffin. This is becoming quite the morning tradition onboard! 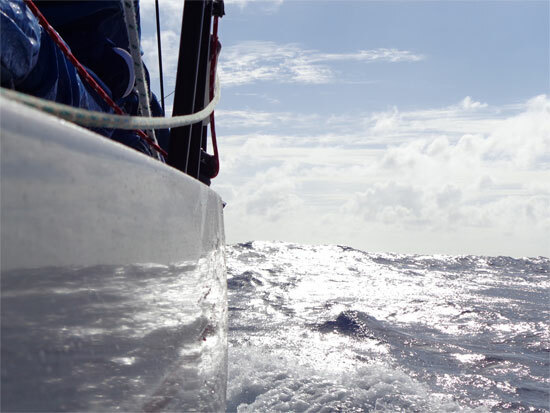 From there, we just sail … we take our watches with four hours on and four hours off. 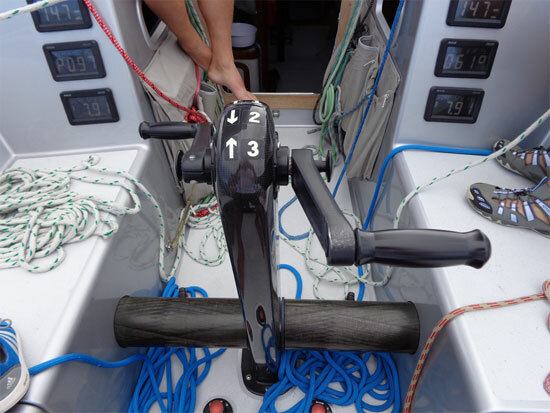 When you are on, you rotate through the jobs of sailing the boat, steering, trimming the sails, grinding the big winch and monitoring navigation. When you change, it might be your turn to clean dishes, cook, check equipment, take care of personal hygiene or even get a couple of hours of sleep! And then, you start over again. It’s a routine, for sure, but time slips by quickly too. It’s hard to believe we are at the halfway distance point … and maybe a bit more than halfway time-wise. The one thing that interrupts the routine is the call from the navigator to “GYBE! 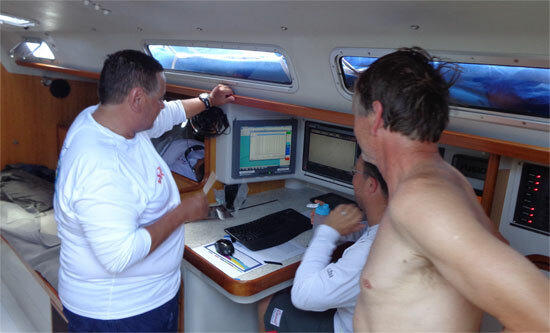 !” This call sets in motion a number of things … first, the four crew on deck each take to a familiar job … one drives, one will be on the release of the spinnaker sheet (rope that trims,) another will be on the take up sheet (other side of the boat rope that trims) while the fourth will grind the big “coffee grinder” winch. This is the double handlebar configured winch that packs super powers and five gears! Everyone in place … ok, here we go! We’re GYBING! The driver turns the boat, the release lets the line go in a timed controlled flow, the trimmer takes up the new line as it comes around and the grinder spins the handles with all the energy he has, to help pull in the new line, at which point, that 2000 square foot monster spinnaker collapses, flutters and then floats around the front of the boat and shifts over to the OTHER side of the boat where it puffs right up again. And all the while, we are wishing we had a fifth set of hands to help with the other lines and such that get pulled and trimmed as necessary. When done right, a gybe is a beautiful maneuver. When done wrong, it’s a bad McMuffin … bit of a hot mess. We’ll probably repeat this same ritual of actions 50 to 70 times between California and Hawaii!! 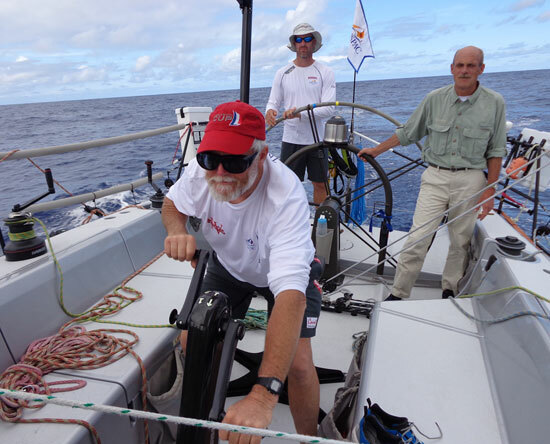 So, our days continue one after another, mile after mile on to Hawaii. It’s up to us to generate our own excitement and keep our minds keen. That’s where old jokes, good friendly barbs and lots of laughs among great friends come in real handy. Wouldn’t trade the experience for anything!